Due to script delays for the cartoon show that I’m currently storyboarding on, I found myself with a 3 week break between storyboards. Much to the disaproval of my bank account, rather than panic and try to find work to fill the gap, I’m going to try something that I haven’t really done before….. I’m going to focus on some projects of mine that I have been neglecting. (One of those being The Possum #4). So that means for the next 3 weeks I will be attempting to get as much inking done on The Possum as is possible, as well as begin animating a little 30 second pitch for an educational childrens cartoon that could be pitched as interstitials. 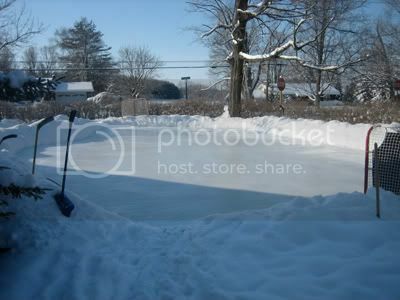 (I’ll also be flooding the rink that I have made in my backyard, and taking the odd skating break:). Usually when I set goals for myself, they are totally unrealistic, but if I get half of what I wanted to get finished, completed, then I’ve exceded any sort of realistic expectations. With that said, I don’t usually make New Years resolutions, but I do hope to focus more energy on my own projects in 2009. I feel like I hit a brick wall in 2008, as my focus shifted from comics that don’t pay, to storyboards that do pay, so I could attempt to pay off some debts that I aquired from moving, having babies, and buying new cars in 2007. I’ve gotta find a way to transition out of mindless work for hire, into doing my own work, which is much more fulfilling. I need to make drawing fun again. Why should you buy AXE COP volume 3!?? 24 pages inked and ready for the scanner! Dude, you need to get yourself a better Drawing Chair, too.. That one, looks like a serious back-breaker to me! Ha. Yeah, that’s just the crappy stool that came with my drawing table. I have 3 different desks in the Possum “studio”: This one, my animation table (from Disney Toronto), and a computer table. The animation desk and the computer desk get the nice comfy chairs, because I’m usually spending 80% of my time at those, working at “real” work. 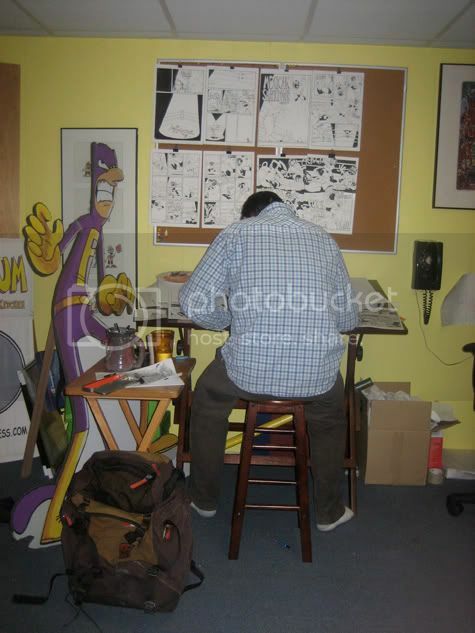 Actually, I don’t mind the stool, because it keeps me working, as I can’t get too comfortable and slouch like I do at my animation desk. I have horrible posture either way. Those unnexpected weeks off between boards used to freak me out too…until I started doing what you’re doing now…work on your own stuff…it’s the only way to stay sane! And yeah…get a new chair! You people and your fancy chairs….. Now that you mention it, my back is feeling a little stiff. I concur with trying to focus more heavily on personal work vs. ‘day job’ (even though the pay is better!). Hope you make some headway on your projects. I’m always looking for some more Possum and any new work you may have! Javier: I’ve got so many things half on the go, it’s driving me mental. I really want to finish some of this stuff soon, and I think 2009 is the year to make some serious headway in that direction. The kind words. If only about 8000 other people were looking for Possum comics, then I could quit my job and get some of this stuff finished. gdaybloke: Don’t act so surprised. I’m right on my monthly update schedule….. The first thing that goes when I’m busy is showering. The next thing is the Blog. Hey! another person who wants to give me money. Now all I need is 7999 more…… I’m 1/8000th closer to quitting my day job! Dude, your not going to TCAF this year? You should get a hold of Butcher, fix that up. I think I’m passing on TCAF this year. I told myself no more conventions until I get issue #4 finished, and there is no guarantees I’ll get it finished by then. It has to be finished by the Fan Expo though, because I’ve already payed for that one.